What were the reactions of American Evangelical denominations toward the American Revolutionary War (i.e., Baptists, Quakers, Methodists, Anglican, etc.)? After reading about MacCulloch’s viewpoint of the spirituality of the Founding Fathers, would you consider America to be founded upon Christian principles? Why or why not? How did the shaping of the Constitution by the Founding Fathers and the revolutionary elite impact the way religion was practiced in America? Reactions of the various denominations toward the Revolutionary War were mixed. Scotch-Irish who had their own issues against the British were supportive of the war. Baptists did not have a single answer, though they felt oppressed by compulsory levies for the Congregational Church in New England. Quakers were pacifist and suffered for not supporting the revolution. Methodists followed John Wesley’s lead and were loyal to the crown as did Anglicans though due to the dominant nature of Anglicanism in America where many Revolutionary leaders were Anglican by denomination. I consider the spirituality of the Founding Fathers who founded America to be based on Christian principles. Their ideals were based on the principles of Christianity which were not necessarily bogged by dogma. There were many competing denominations and one of the reasons people came to America was the freedom to worship. They still shared the idea that the God or the Creating Force intended good for people, but did not agree on exactly how it should be done, so each was given the right to figure it out for themselves. Even though much as been made of the lack of God explicitly, the ideals of Christianity were present. Even the Free Masonry influence is based on God and Christianity. Free Masonry requires a belief in a higher power and oaths taken with a Bible. The Free Masons have expanded and along with the Bible they now include the Koran and Torah. Zinzendorf was strongly influenced by the teachings of August Hermann Francke (1663 – 1727), a pastor and teacher at the University of Halle, a center for the Pietist reforms focusing on personal devotion, Bible study, social action, and other forms of practical outworking of the faith. Zinzendorf was inspired to renew and reform the Church by emphasizing personal and heartfelt religious experience. He stressed emotion against reason as the best means of reaching to Christ, and set aside all previous Christian doctrinal requirements. (loc. 14421) His communities also worshipped seven times a day on weekdays, and longer on Sundays. (loc. 14417) With a strong belief that the Gospel must be spread around the world, under his leadership, the Moravians established schools, social care facilities, and sent missionaries abroad to teach and preach. The Moravians also passionately carried out missions to slaves, particularly in the Caribbean. During a visit to Copenhagen in 1731, Zinzendorf met a former African slave, named Anthony, who had become a Christian. Anthony, at Zinzendorf’s request, met with other Moravians and recounted his experiences and sufferings while being a slave in the Caribbean. He told them that the slaves there needed to hear the Gospel preached to them. His testimony inspired many in the Moravian community to become missionaries to the slaves in the West Indies. Before long, an estimated 10% of the Moravian Church served as foreign missionaries, principally in the Americas and also in India. 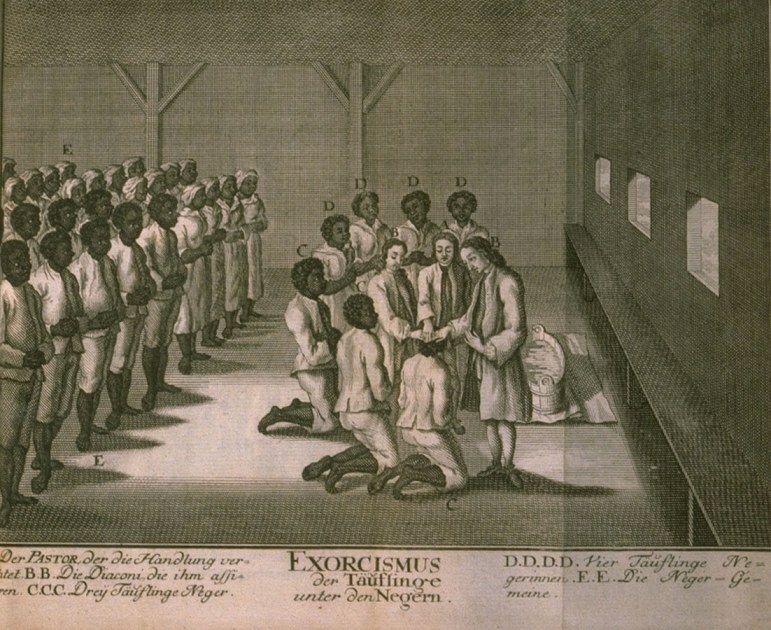 They were so dedicated and passionate in spreading the Gospel to the slaves there that some of the early Moravian missionaries went so far as to become almost slaves themselves in order to minster to the slaves working in the sugarcane fields in the West Indies, where many of them died due to the harsh conditions there. It was interesting to read about the Moravian Church and movement. Prior to reading this chapter, I had not even heard of them. I can see many strands of Pietism and the Moravians even today. Their emphasis on experience over doctrine, the need for personal conversion, and the zeal the Moravian and Pietist missionaries had to spread the Gospel to some of the harshest places to live on earth can be seen in today’s modern evangelical communities. It was also very interesting to see how each movement influenced one another: the Pietists splintered off from the Lutherans, who later on would influence the Moravians, who would then influence John Wesley and the Methodist Church. Each movement would play their part in influencing the evangelical mindset of American religion in years to come. In Howard’s essay, I believe that would be the Congregational Church in New England, not the Congressional Church.